After President Donald J. Trump publicly chided Attorney General Jeff Sessions last week for not doing enough to go after leakers of classified information, the head of the Justice Department announced Friday a new concentrated effort to find those responsible. 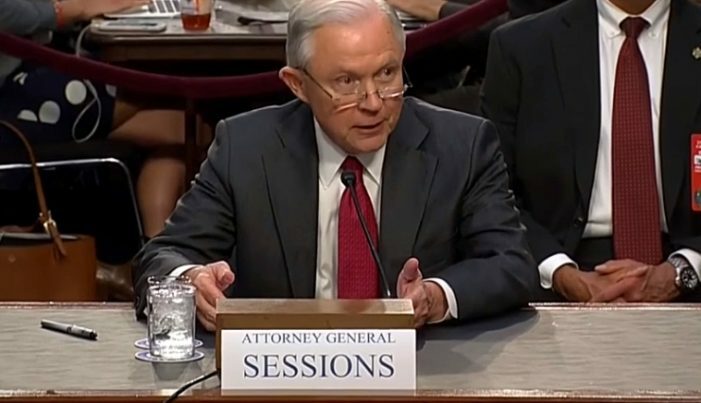 As reported by Zero Hedge, Sessions — at a press conference — essentially declared war on the leakers and the media that has been publishing information which they have obtained thanks to highly illegal actions. But since most all of the leaked information has been damaging to the president — right in line with the disgustingly dishonest “mainstream” media’s and the Deep State’s agenda — establishment outlets have gleefully complied. Sessions added that since January when the Trump administration took over, the Justice Department has tripled the number of active investigations into leaks of classified and sensitive information. That rings true, given that the number of leaks coming from government officials within the Deep State bureaucracy is unprecedented in the era of Trump. Adding that while the department respects the press’ constitutional free speech and vital role in a free society, reporters and media outlets do not have the right to endanger the American people through the publication of highly sensitive information that either puts the country at risk or makes it impossible for the administration to govern. In a follow-up interview with the Financial Times, Sessions said, “We are taking a stand. This culture of leaking must stop. “These leaks hurt our country. Every agency — and Congress — must do better,” he said. Clearly, the administration is throwing down a gauntlet here, and not a moment too soon. There have been some suggestions that world leaders, following the Washington Post’s publication of full transcripts earlier this week of Trump’s conversations with the Australian and Mexican heads of state, have left them wary of being open and honest with him. A report in The Hill quoted Dan Coates, the director of national intelligence, as issuing his own ominous warning: “If you improperly disclose classified information, we will find you, we will investigate you, and we will prosecute you to the fullest extent of the law. You will not be happy with the result. “Any disclosure outside of authorized channels is a criminal offense, and we will simply not tolerate the illegal release of classified information,” he added. But at times the leaks have been so distracting they have taken the president off-message and given the Republican-controlled Congress an excuse not to do what they were elected to do, namely repeal and replace Obamacare and tax reform. Plus, they have endangered national security. Soon, however, if the Sessions initiative is effective, the leaks will finally dry up to a trickle after a few people are made examples of, which may include members of the press.